Meeting Bhaichung Bhutia | It is Siddharth's world! 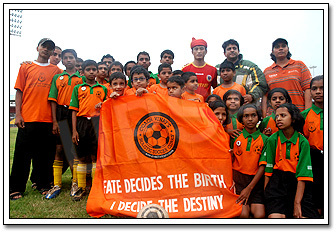 On the 3rd of October, 2009, I got the opportunity to meet a footballing legend, Bhaichung Bhutia. My soccer coach, Coach Vinay took our team, UPSA(United Poona Sports Academy) to meet him. It was an honour to meet him. Thats me in the front row with the specs!